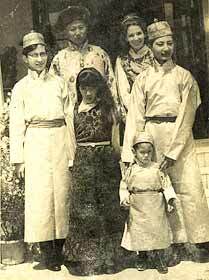 Chogyal Palden Thondup Namgyal with his family. Chogyal Wangchuk Namgyal is on the extreme left. Sikkim and the injustice this tiny Kingdom in the Himalayas has had to experience has always been close to the Radical Royalist's heart. Today the 13th Chogyal celebrates his 60th birthday. On the Sikkim Bhutia Lepcha Apex Committee (SIBLAC) is an accurate portrait of the present head of Sikkim's Royal Family.